A translucent star creature about to digest a meal. As you ride the toy-like RT to this forlorn transit outpost in the middle of the night, your weary mind begins to wander. You start to reminisce, to daydream about that special gal who once captured your heart, long ago. You know who I’m talking about. Her gentle, sad smile clouds your thoughts to this very day. What ever became of her? Where is she now? Arriving at Ellesmere interrupts your reverie, but not the mood of loneliness. By far the least-used station in the entire TTC system, Ellesmere trounces even the infamous Bessarion for lowest ridership—on most days, a single Toronto Rocket train would suffice to contain all those who pass through its gates. 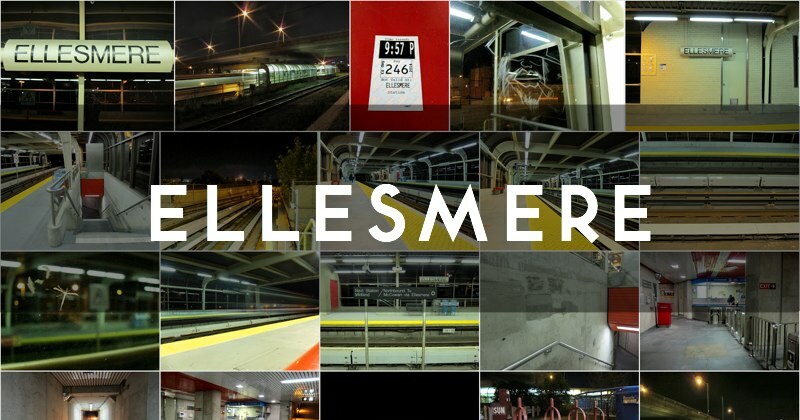 Ellesmere station opened March 22, 1985. A jewel of fluorescent solitude in the evening dark, Ellesmere brooks no rival for contemplative stillness. Enjoy it while you can, and accept that you can never change the past.